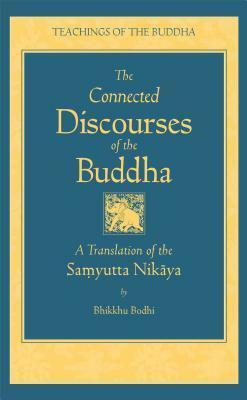 This volume offers a complete translation of the Samyutta Nikaya, The Connected Discourses of the Buddha, the third of the four great collections in the Sutta Pitaka of the Pali Canon. The Samyutta Nikaya consists of fifty-six chapters, each governed by a unifying theme that binds together the Buddha's suttas or discourses. The chapters are organized into five major parts. The first, The Book with Verses, is a compilation of suttas composed largely in verse. This book ranks as one of the most inspiring compilations in the Buddhist canon, showing the Buddha in his full grandeur as the peerless "teacher of gods and humans." The other four books deal in depth with the philosophical principles and meditative structures of early Buddhism. They combine into orderly chapters all the important short discourses of the Buddha on such major topics as dependent origination, the five aggregates, the six sense bases, the seven factors of enlightenment, the Noble Eightfold Path, and the Four Noble Truths. Among the four large Nikayas belonging to the Pali Canon, the Samyutta Nikaya serves as the repository for the many shorter suttas of the Buddha where he discloses his radical insights into the nature of reality and his unique path to spiritual emancipation. This collection, it seems, was directed mainly at those disciples who were capable of grasping the deepest dimensions of wisdom and of clarifying them for others, and also provided guidance to meditators intent on consummating their efforts with the direct realization of the ultimate truth. The present work begins with an insightful general introduction to the Samyutta Nikaya as a whole. Each of the five parts is also provided with its own introduction, intended to guide the reader through this vast, ocean-like collection of suttas. To further assist the reader, the translator has provided an extensive body of notes clarifying various problems concerning both the language and the meaning of the texts. Distinguished by its lucidity and technical precision, this new translation makes this ancient collection of the Buddha's discourses accessible and comprehensible to the thoughtful reader of today. Like its two predecessors in this series, The Connected Discourses of the Buddha is sure to merit a place of honour in the library of every serious student of Buddhism.